I am NO green thumb. So, I try to avoid as many living plants as possible. Sometimes my mother plants real, live plants/flowers in my window boxes. I am not ammused. But, I’m too lazy to take them out. And, I’m especially not a mum person. They really aren’t all that attractive, but they say “Fall”. So I go with it. Here’s what I did to zing up the typical “mums in a window box” type of thing. 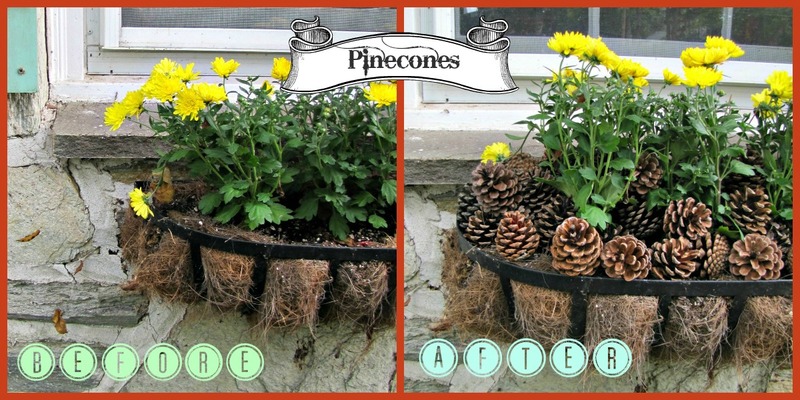 It’s amazing what a simple pinecone will do. Another spot I used some cheap and easy decorating was my front door. Now, I’m not actually going to show you my front door, ’cause I haven’t painted it yet. snort. So, you’ll have to settle for a peak at the general area of the front door. And, if you think I’ve gotten around to painting the actual house yet, your funnier than my friend Lisa. So just imagine a beautiful shade of mocha brown stucco behind all this hdge podge. super cute grape crates, from? who knows where. Probably somebody’s trash. Or my brother-in-law Pat, who makes his own wine. Yes, yummy. yes, I believe they were Merlot grapes. I also threw some pinecones in these window boxes. With a few candles mixed in. Super cute!! Great ideas…my front yard is tore up right now we're in the process of getting new sod laid. Might give a few of your ideas a try!